Piecing together our evolutionary history can be particularly difficult because we are not able to study the behaviors of extinct hominin* species as they are occurring. That is why we look toward what these species left behind for clues and data. The earliest known primate archaeological evidence is known as the Oldowan. This consists of a tool-kit made of stone. The creation of these stone tools by hominins dates as far back as 3.3 million years ago with the Lomekwi, from West Turkana, Kenya (Harmand, 2015). With the Oldowan, we begin to see a systematic reduction of rock, rather than the creation of tools due to random bashing. In other words, these hominins would take a piece of rock and break pieces away from it, one by one, to create a tools. This process is known as knapping. 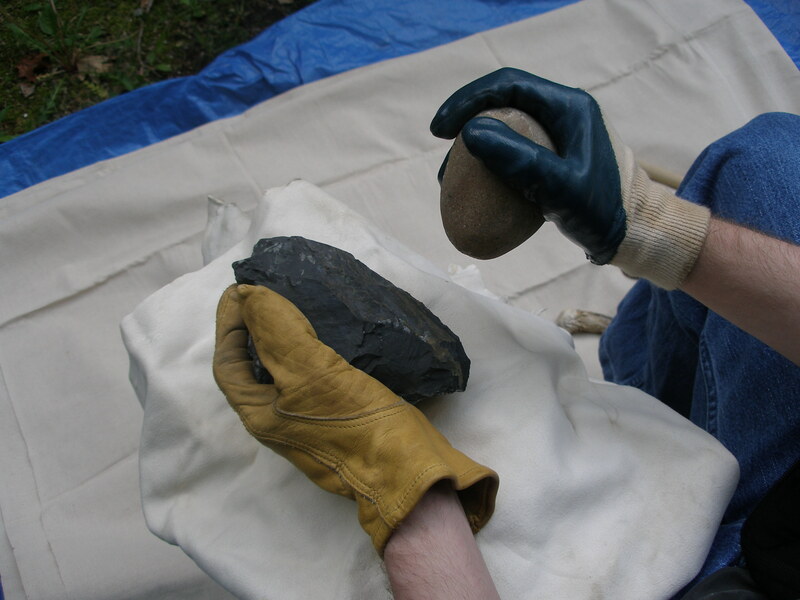 While knapping, the main piece of rock that you are working with is referred to as the core, whereas the pieces that are broken away are known as flakes. Evidence for systematic knapping becomes especially clear at around 2.5 million years ago in areas such as Gona, Ethiopia (Semaw, et al. 1997). At this site, the researchers found both flakes and cores. By simply putting the pieces back together, they were able to display how systematic this process truly was. These carefully chosen rock pieces were broken down in a fashion that required both experience and at least some degree of planning. This planning can also be seen in the fact that the raw materials were clearly “chosen” and not selected randomly. Hominins were deliberately selecting rocks disproportionately to their distribution, based off of the material that they were made of (Wynn & McGrew, 1989). This implies active thought behind raw material selection. While both ancient hominins and wild chimpanzees are known for tool-use (See the Bio Bay blog post titled “Chimpanzee the Toolmaker: A Study of the Complex Behaviors of Wild Chimpanzees”), there is a difference in the types of tools that we have evidence of them creating. Many of the tools used by chimpanzees are crafted using vegetation. Unfortunately, vegetation does not preserve well in the archaeological record. Therefore, if the Oldowan did contain wooden tools, we still have no evidence of it. On the other hand, chimpanzees in the wild are not known to create flaked stone tools. To see if chimpanzees are capable of making these sorts of tools, scientists turned to experimentation. One of the most well-known cases of a chimpanzee creating flaked stone tools in an experimental setting comes from the study of Kanzi the bonobo (Schick, et al. 1999). This study involved the analysis of three years’ worth of artefacts created by him. During experimentation, Kanzi would be presented with the raw materials needed to knap sharp, flaked stone tools into existence. The researchers also presented Kanzi with a food reward that could be seen, but only accessed if Kanzi managed to cut through a thick, nylon cord that was used to keep the food container shut. Over the three-year period, Kanzi’s ability to flake stone tools under experimental conditions improved. Kanzi even began using flaking methods that were not previously demonstrated to him. Even though the researchers showed the bonobo how to knap using handheld percussions, he eventually began throwing stones at each other. This is perhaps due to the fact that the amount of force that can be generated from throwing is greater than that of handheld percussions. However, this does appear to decrease the accuracy of the strikes. It should also be noted that Kanzi preferentially used larger and heavier stone tools. The researchers believed that Kanzi had a good sense of the potential usefulness of flakes and fragments as cutting tools. 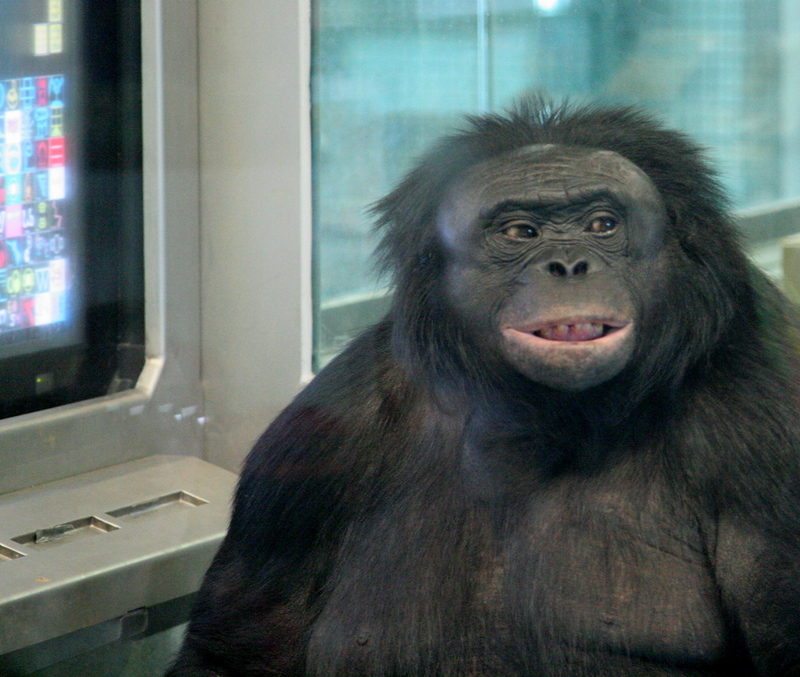 Unfortunately, this experiment has not yet been replicated using other common chimpanzees/bonobos. Doing so would help increase the confidence of these results and would also help answer a few questions regarding the “range” of chimpanzee intellectual capabilities. In other words, it would help scientists discover if all chimpanzees are capable of performing these sorts of tasks once trained, or if Kanzi is a very special ape. Due to the tremendous amounts of data collected regarding both the capabilities of chimpanzees and the Oldowan industries, scientists have been able to begin making assessments regarding the behaviors of the hominins that created these stone tools. The paper, An Ape’s View of the Oldowan (Wynn & McGrew, 1989) began to look at the records to determine the “minimum” capacity needed to replicate the behaviors that produced the Oldowan industries. This study was performed before the Kanzi experiments, and the researchers still determined through cognitive analyses of chimpanzees that the Oldowan does not massively exceed what chimpanzees are capable of. In other words, the Oldowan archaeological evidence alone does not prove that these ancient hominins had greater than an ape adaptive grade (they were not necessarily doing anything that a chimpanzee cannot). However, even Kanzi failed to replicate the full range of tools gathered at Gona, Ethiopia with regards to the variety of tools seen (Schick, et al. 1999) (Semaw, et al. 1997). With this in mind, it is interesting to begin to question just how advanced these ancient hominins must have been. To do so, we should consider the field of comparative psychology. This will be the topic that I focus on for my next blog post. Until next time, carry on with curiosity. See the Bio Bay post titled “The Men and Woman Who Walked Beside Our Ancestors” for more information. Harmand, S., Lewis, J. E., Feibel, C. S., Lepre, C. J., Prat, S., Lenoble, A., … & Taylor, N. (2015). 3.3-million-year-old stone tools from Lomekwi 3, West Turkana, Kenya. Nature, 521(7552), 310-315. Semaw, S., Renne, P., Harris, J. W., Feibel, C. S., Bernor, R. L., Fesseha, N., & Mowbray, K. (1997). 2.5-million-year-old stone tools from Gona, Ethiopia. Wynn, T., & McGrew, W. C. (1989). An ape’s view of the Oldowan. Man, 383-398. Schick, K. D., Toth, N., Garufi, G., Savage-Rumbaugh, E. S., Rumbaugh, D., & Sevcik, R. (1999). Continuing investigations into the stone tool-making and tool-using capabilities of a bonobo (Pan paniscus). Journal of Archaeological Science, 26(7), 821-832.